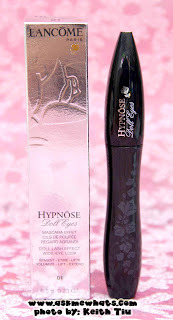 I won't leave you without a blog post so I'm doing a review on one cute mascara from Lancome called Hypnose Doll Eyes Mascara. The name itself is super intriguing, who doesn't want to look like a doll? (Hopefully not the Chaka doll..laughs) ---> sorry Filipino humor there! The secret behind doll lashes, finally revealed! Lancôme's most flirtatious lash look. A volumized, extended and full lash fringe for a wide-eye look. The secret behind this amazing result? A new, unique, cone-shaped brush provides an extremely smooth and clean application, precisely defining even your hard-to-reach corners and lower lashes. Combined with the exclusively developed FiberShineTM formula, it sculpts, curls and loads each lash for the ultimate shiny lash fringe. Lift and thicken every single lash without weighing it down. Push up your lashes for your most flirty, wide open eye look. Cute packaging that can still count as "professional"
Cone shaped brush which makes it easier to reach the inner corner of the lashes. The tip of the brush is best used on the lower lashes applied in vertical motion. Coats each lashes pretty well and gives a nice, natural, thick lashes effect. Texture is not too runny nor too dry, it's just right. Holds the curl the whole day! So far, this does not smudge on a super hot and humid weather. At the end of the day, it is easy to remove the mascara with regular eye makeup remover. 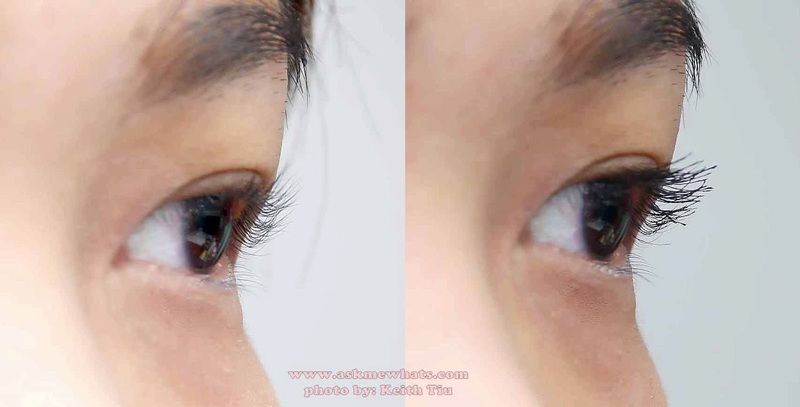 Did not lengthen my lashes greatly as expected for "Doll Eyes". Unique brush head, formulation is light and doesn't create crunchy lashes. Gives good definition to your lashes minus the "fake" look. Never share the same mascara wand with other people, if you are a makeup artist, use a disposable mascara wand! 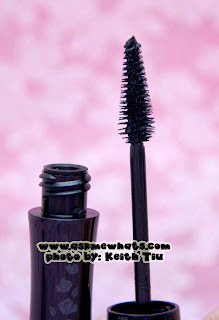 A bit tricky to apply at first, I like using the tip of the brush first and apply good amount of mascara on the inner corner of the lashes, then coat the rest of the lashes. 2-3 coats are enough if you have naturally long and thick lashes. 3-5 coats are okay for people who have non-existent lashes. If your lashes clump together, use a spoolie brush to comb your lashes and separate the clumps. For expensive mascaras, you can go beyond 3 months as long you are using the mascara on your own. For clients --- yes! For myself, I prefer unscented mascaras. Anyone who doesn't mind splurging on mascara. 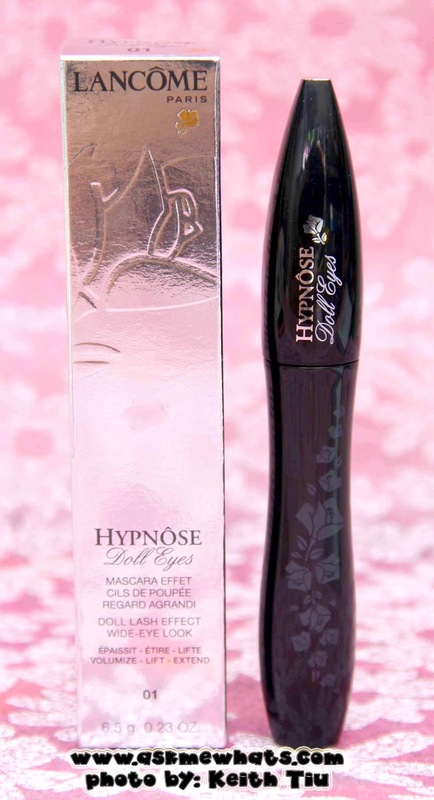 This is perfect for those aiming for wide-eyed look as this mascara definitely gives a nice definition coating each of your lashes making it appear thicker and longer. At Lancome Counters at Rockwell, Powerplant Mall, Rustan's Makati and Shangri-la for Php1,895.00 (approx $43.00). Feel free to add them up on Facebook to learn more about products and contests. Since my lashes are naturally short and sparse, I want to show the effect of the lashes in this angle as it will show how the Lancome Hypnose Doll Eyes Mascara can actually hold my curl at the same time, defining each lash hairs creating thickness and volume. For me to be able to create a "Doll Eyed" look, I have to apply at least 5-6 coats of Lancome Hypnose Doll Eyes Mascara brushing at the end with a spoolie. What's your favorite Lancome mascara and why?